It’s starting to reach the most humid time of the year down here in Houston; June is upon us and that means 90-100 degree days every day, plus at least 85% humidity most of the time. Hair is frizzing, everybody’s sweating and day time spent outside is kept to a minimum. This weather tends to sap my appetite for elaborate meals that require anything other than the fridge. Produce and snacks are the name of the game when visiting the great outdoors feels like wading through jello at best. Add shredded chicken to a large bowl and season with salt and pepper. Add wet ingredients, tossing well to coat, then fold in the corn and bacon. I just love a good pork tenderloin, don’t you? It’s an inexpensive cut of meat that can turn out flavorful, juicy and delicious with just a little marinade and some baking. This moist and flavorful pork is one of my new favorites. I love the flavors you get from the dijon mustard and red wine vinegar, mixed with the sweetness of the honey. The tenderloins turn out fork-tender and delicious with a delicious sort of crust from the glaze. This pork would be delicious as a main course, or incorporated into a salad or sandwiches. Try this for your Sunday dinner this week as a simple, but impressive dish, or make a weeknight special with this easy recipe! Preheat oven to 375° F. Place pork tenderloins in a shallow baking dish. In a small bowl, whisk together dijon mustard, red wine vinegar, honey, garlic, rosemary, and olive oil to create a glaze. Pour glaze over pork, turning to coat evenly. Sprinkle with salt and season with pepper. Roast pork in oven, spooning glaze over pork occasionally, until thickest part of pork reaches 155 degrees on an instant-read thermometer, 30 to 35 minutes. Remove from oven; let rest until pork reaches 160 degrees, about 10 minutes. In a 3-quart saucepan, melt butter over low heat. Stir in flour, ½ teaspoon salt, ¼ teaspoon pepper, mustard and Worcestershire sauce; continue cooking on low heat until smooth and bubbling. Add milk to butter-flour mixture and heat until boiling, stirring constantly. Boil, while stirring, for 1 minute, then remove from heat. Stir in cheeses until melted and smooth. 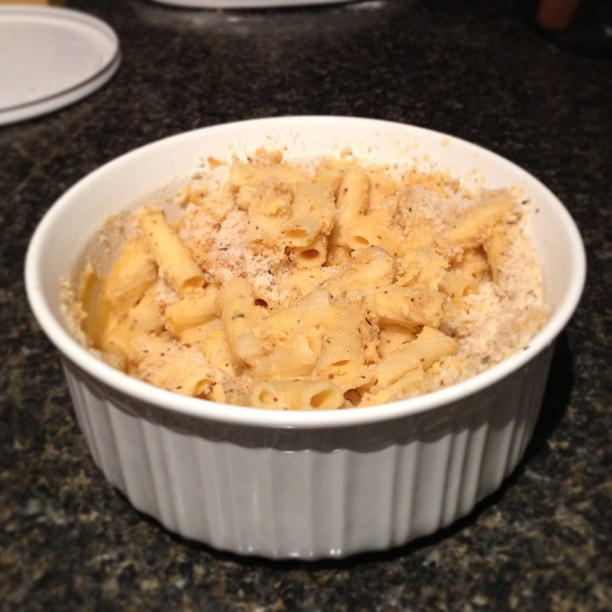 Combine pasta and cheese sauce in a 2-quart casserole dish and mix well. In a bowl, combine the bread crumbs, ½ teaspoon salt, ¼ teaspoon pepper, paprika, and thyme. Pour mixture over the top of the casserole dish. Bake uncovered for 20-25 minutes, enjoy!